I’d been looking forward to this trip for months having signed up following an email from Sailing Logic tempting crew on the delivery trip. They have two boats competing in Dartmouth Royal Regatta – both Beneteau First 40’s. I’d raced on one of these at Cowes Week last summer. The trip had been brought forward by a day due to weather forecasts anticipating very strong winds on Tuesday afternoon and into the night. I checked the Met Office forecast for our expected departure time and it looked likely we’d probably experience F6. Wind guru confirmed that overnight we’d see up to about F6 and then late on Monday possibly even stronger (though well after when we should have arrived). Our safety briefing was quickly underway and it was clear the skipper wanted to leave as soon as possible so we didn’t miss a tidal gate and risk a long passage. He expected around a 16 hours passage arriving 10am on Monday. One of our crew cancelled late and the other couldn’t be reached – we slipped at 1745 with four crew, skipper and mate, and Mike completed a very thorough safety & passage briefing as we motored down the Solent. Watches would be 3 hours on/off with myself/Andy and Leanne/Jess joined by the skipper and mate rotating. We motored all the way to the Needles raising the mainsail as we rounded Calshot Castle. By the time we reached the Needles we had made up the 20 minute head start Arthur had on us by sticking to the northern side of the Solent where the tide against us was weakest. Low water was at 1702 and even with 1.7m of tide we should have been fine but all of a sudden the boat came to a stop – I’ve grounded before but never at 6 knots out of the blue. Andy was at the helm at the time and he looked like he’d seen a ghost. I was up on the foredeck with the mate checking the head sail. Mike took control very quickly, putting the engine into neutral and having us all (and the mast) hanging out to starboard. We backed out of our parking bay in a few minutes. It was deemed no damage was likely in the soft sand. We hoisted the jib as soon as we were out past the Needles and in the North Channel. Within 20 minutes we had another scare as the depth dropped to about a meter below the keel – looking at the track recording we were about a cable from the Shingles. We had full main and the number 3 jib (our smallest) and started our course to the way point off Anvil Point. I stayed up about an hour past our watch as Leanne took the helm. The boat was well heeled over and the wind was strong – it definitely took some fighting to control her. Leanne was not comfortable and Pete did a good job, I thought, helping her gain confidence. I disappeared for some kip but Andy stayed with her throughout the watch (he is married to her!). As I tried unsuccessfully to get some sleep, I thanked myself for taking Stugeron from 24 hours prior – I’m sure the motion would have had the better of me – a lesson learned the hard way from my first Channel crossing. I thought I heard them putting a reef in close to midnight. As we came on watch we were already at our way point off Portland Bill – we’d made really good progress. Andy and I took one hour turns at the helm and then split our final hour. It was absolutely pitch black – no reference point at all other than the stern light of Arthur which had pulled away as we had reefed in. I’ve never sailed in such darkness. For an hour I focused only on the instrument at the mast with our electronic compass heading and tried to keep it at 245 – it took me a good 10 minutes to get into the zone. All my weight was on my right leg, jammed against the foot wedge, my other knee bent full with my foot high. I was clipped on so I wasn’t worried about going over but if I slipped I knew it would really hurt. I was steering by feel now, counteracting the wind gusts with port rudder and then quickly easing it when the rudder pressure lapsed. I was doing a reasonable job I thought. It carried on like that for most of our watch. We turned in at 0300 as Girl Watch took over. Jess woke me at 0530, I reckon I’d got about 90 minutes sleep. I wanted to see the sunrise but there was no chance of one of those. Leanne was a different person, totally in control, oozing confidence. 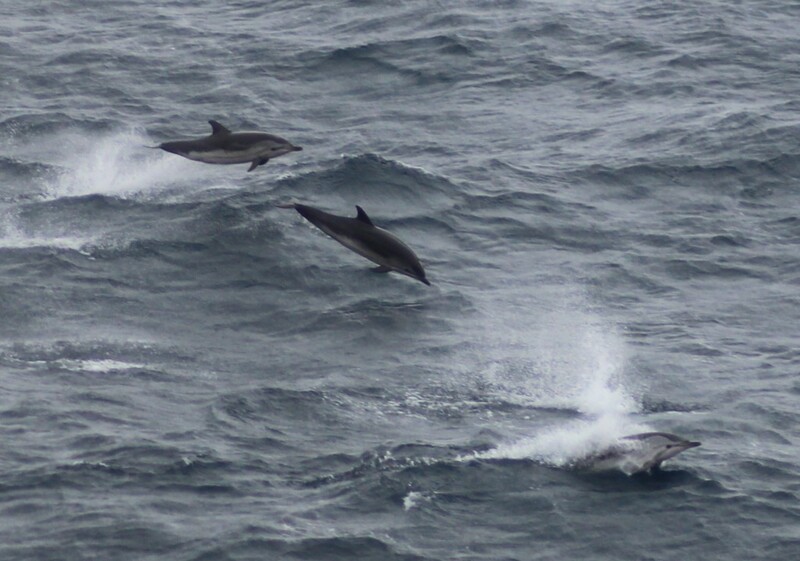 Half an hour later we had a pod of dolphins racing with us, showing off to us. We reckoned on upwards of 25 of them for at least an hour. Pete sent me forward to sort out the leach line on the mainsail. It took me two trips to sort it out to his satisfaction, I thought he was kidding second time around. As I helmed during our final watch I noted how the boat just cut though the sea state without effort. Although we had consistent force 6 winds and waves of around a couple of metres she was never really taxed. I’ve no doubt her racing sails made a considerable difference to our journey time of around 12 hours – when set right they had the appearance of solid sheets of rock, not even fluttering, their shape lovely. We sighted land at around 6am, I think, and then spotted the obvious Mewstone Rock and the chasm between the cliffs that is the entrance to the River Dart. The cliffs were shrouded in mist and the entrance looked very mysterious and atmospheric. The rain continued as the pastel covered houses on the western side came into view. Log entry. 24.8.14 Galahad. 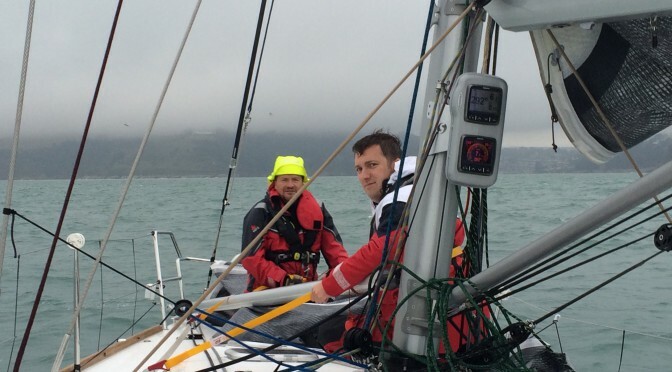 Beneteau First 40′ Crew Hamble – Dartmouth. F6. Moderate. 102NM tidal. 6 night hours. I also know Lou’s Bro… Jim. Could you let me know how you went around the portland bill? Did you use the inner passage? How did you calculate your timings? did you use HW dover? 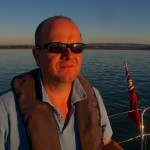 Im planning a summer trip from Chichester to Dartmouth. Many thanks. Hi Art – thanks for the feedback. We passed about 3 miles off Portland Bill because there’s nothing really to gain (distance wise) by going close in, as well avoid having all the timings to manage so carefully.